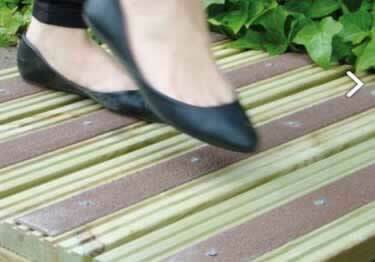 A quick and easy way to improve safety on wood decking or any wooden walkway. Our Anti-Slip Decking Strips create a durable, non-slip surface over existing wood decking, which can become dangerously slippery when wet or covered with algae. Can these be used on outside wooden steps? How thick is the material? Is it similar to asphalt roofing tiles? Hi there how many strips come in a box? ?? I have a question: about how much space should be left between the screw-down fiberglass anti-slip decking strips on an outdoor wooden ramp. Also, what factors should go into deciding between the 2" strips and the 3.5" strips? In case it matters, the 11-foot ramp has twice-daily access by one or two people (on foot) and twice weekly access by a riding lawn mower. Thanks in advance! Just what the safety guy ordered! Comes in various lengths, can be cut shorter if needed. fits wooden deck boards perfectly. Don't build a ramp without them! Excellent product! Quick shipping too. Ideal for wheel chair ramp! The Anti-Slip Strips are working great for a slippery bridge when wet or frosted over! !